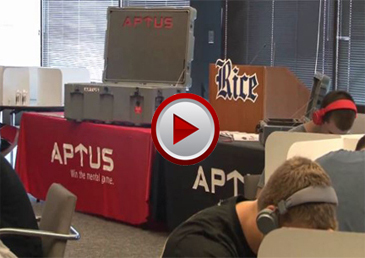 The Rice University Owls joined the growing list of universities across the country who are discovering what APTUS can do for them. Rice's Head Coach Dave Bailiff along with Texas Christian University's Gary Patterson are among the numerous head coaches in the Big 12, SEC, Conf-USA and Big-Sky that seek to gain this objective competitive-edge on and off the field. The Rice Owls open their 2013 season against SEC Texas A&M Aggies in College Station, August 31st. Here Coach Bailiff addresses members of the Houston media who were on-hand for this unprecedented preseason Assessment.